← Wanna read about my hernia operation, Part One? My hernia operation, Part Two . . . Okay, come on now, admit it—you’ve been waiting with bated breath for the second installment of my recent hernia operation. I can understand your interest in this because everyone, whether male or female or a combination of both, are subject to such surgery. Other than a few statistics extracted from the web, I’ll leave it up to you to do the research. Click here to learn just about everything you probably never wanted to know about hernias and hernia surgery. It’s the most common operation performed by general surgeons in the United States, and males lead females in hernia surgery by a ration of 3:1 in the US. More than 750,000 inquinal hernias are repaired in our country every year by general surgeons. Now on to Part Two of my quadrilogy, the diagnosis of the hernia. 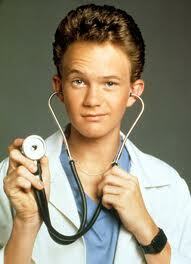 I reported to the General Surgery clinic as directed and was examined by a Doogie Howser look-alike, the young man who performed fantastic surgeries on the television show Doogie Howser, M. D. from 1989 to 1993. My doctor (not really a look-alike, just young looking) replicated the hands-on exam that I endured in Internal Medicine and scheduled me for a sonogram to determine the exact location and the size of both hernias. He decided that the left hernia warranted surgery, but the right fissure was small and would not need surgery unless it expanded or became uncomfortable or painful—uncomfortable or painful for me, of course, and not for the hernia. The doctor told me that he had three hernia surgeries in his early twenties, and since then had no other symptoms. I suppose that was meant to reassure me concerning my pending surgery, but it didn’t work. I wasn’t sleeping well before I was scheduled for surgery, and the wait between scheduling and operating was for too short and in no way helped my sleepless nights (I unashamedly admit that I dozed off for a few hours in the mid-afternoon while waiting, and in fact I still do). I believe it is somehow related to age, but in my case I believe that it’s because I am bored, and napping is something that seems to come naturally for me to make the time pass. The sonogram gave a perfect picture of the two hernias, and I was scheduled for surgery the following week. I made several demands—no, make that several requests—including local anesthesia as opposed to general, no breathing tube in my throat and finally, that I had to be back home before dark. My demands—I mean requests—were given consideration and the doctor said they would do their best to meet them—that was shortly after his laughter subsided. Okay, that’s the second part of my quadrilogy, the diagnosis. That’s my story and I’m sticking to it.